Dark, leafy greens such as spinach, kale and collards are packed with the essential antioxidants lutein and zeaxanthin. These compounds, called carotenoids, help filter high-energy blue wavelengths of light, and protect against free radicals and inflammation. Of the 600 carotenoids found in nature, lutein and zeaxanthin are the only two in abundance within the human eye. However, it’s important to know that your body cannot synthesize these compounds on its own—you need to get them from your diet. Lutein and zeaxanthin are key to helping prevent several debilitating ocular conditions, namely cataracts and age-related macular degeneration. While the debate about eggs and cholesterol rages on, one thing is certain: egg yolks contain lutein and zeaxanthin, along with zinc. In a recent study, antioxidant supplements augmented with zinc were of benefit to those suffering from age-related macular degeneration and vision loss. Plus, zinc is considered one of the five key nutrients for eye health, as noted in the Age-Related Eye Disease Study. Citrus fruits and berries have high concentrations of vitamin C in the form of ascorbic acid, which has been shown to be a potential weapon against many conditions, including cancer. Scientific evidence points to the efficacy of vitamin C in lowering the risk of blindness and cataracts. Vitamin C is highly concentrated in the lenses of the eyes, and because of its symbiotic relationship with the absorption of iron in the body, it’s essential to the health of ocular blood vessels. Along with the intake of antioxidants beta-carotene and vitamin E, vitamin C intake has even been shown to help slow the advance of age-related macular degeneration. Almonds are packed with vitamin E, which is one of the most biologically active and potent antioxidants around. By protecting the vulnerable tissue of your eyes from damage caused by free radical molecules, vitamin E helps prevent cataract development and slows the advance of age-related macular degeneration, just like vitamin C. Plus, that’s not all this tasty nut can do for your health. Studies have linked almonds to having a positive impact on your brain and heart health, too. 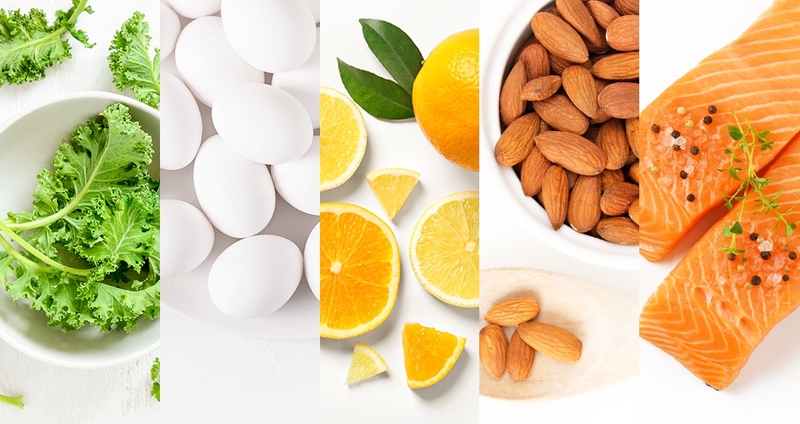 One ounce of almonds, which equates to a handful, delivers about half of the vitamin E adults need daily. Opt for the raw, unsalted variety. It might sound a bit misleading, but the “fat” we’re referring to is the essential omega-3 fatty acids that are found in oily fish, such as salmon, tuna and anchovies. This kind of fish oil is rife with omega-3 fatty acids, essential nutrients which your body cannot synthesize on its own. Specifically, omega-3 from fish oil is an excellent source of DHA fatty acid, a compound which makes up about 40 percent of the polyunsaturated acids in your brain, and 60 percent of the polyunsaturated acids in your retina. DHA is supplied richly during breastfeeding, and is widely believed to support healthy fetal and infant development. In animal studies, DHA deficiencies have led to visual impairment and retinal degradation. A lack of DHA has also been linked to dry eye syndrome. DHA is important for the healthy functioning of nerve cells, including the ones in your optic nerves.